As it is fledging time here in Chicago, it seemed like a good idea to check back on the Calumet nest. Once the fledgling are out and about, they are much easier to see at this site. 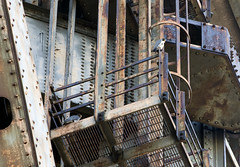 Chicks tucked into corners or holes in the steel beams are impossible to see from the ground. Mary and I made our way down the Calumet and stayed out for about 4 hours. That may seem like a long time to watch a bridge for bird activity, but it is absolutely not. In fact, when one is tasked with finding out information about a wild thing, one often has to sit for hour and hours to wait for said wild thing to make an appearance. Fortunately, it was a BEAUTIFUL day, so standing about outside could hardly be categorized as hardship. About 15 minutes after we arrived, one of the adults landed on a bridge beam high overhead. We both had scopes and I had, of course, the camera gear, so I took a few shots of the far-away backlit bird with little hope the photo would show any useful data. I put the camera away, popped my scope out of the bag and set it up on my tripod, eager to get a look at what Mary had already determined to be a banded bird through the higher magnification. I twisted the front lens cover off easily enough, but when I got to the eyepiece cover, the damned thing wouldn’t budge. Truly, I have no idea what happened. For years, that sucker has popped off if someone looked at it askance, but today it clung to the eyepiece as if it had been glued down with extra-strength crazy glue. As Mary peered through her scope snickering at me, I proceeded to bang the scope on various hard surfaces, try to pry the cover off with a suite of local tools (pebbles, rocks, sticks, etc…) and dance around tugging at it while cursing. All the while, the bird on the beam preened and held its legs out helpfully. Of course. I finally conceded that the scope had won the round when a second adult flew in. I stuffed the stupid thing back in my bag, disgusted, and grabbed my binoculars. The second adult had food and there was the normal chatter between the mates as she (bigger bird, so we presume) made her way through the beams. She landed on a large horizontal beam and looked down and to her left, to an intersecting diagonal beam. My eyes followed and for one split second, I saw the flurry of brown, speckled wings. Mary looked through her scope, but couldn’t see a thing, even though we could both see a cloud of feathers rise up as the adult plucked the prey. “It very well could be sitting right in front of her, but our view would be blocked.” Mary said. If the eyes can’t see, then maybe the ears. We both closed our eyes and cocked our heads, listening. Sure enough, we both heard the high, screechy pleadings of at least one young peregrine begging for food. My scope useless and no sort of 600mm mega-lens at my disposal (or even a 300-500mm lens), I grabbed the camera mounted with my favorite 70-200mm and headed off to see if I could see anything from another direction. Mary decided to stay in place. I crossed the road to the other side of the traffic bridge and made my way to the south side, pretty much under the area we’d seen the activity. Just as I got to the other side, the adults lit on a platform directly above my head and stared down at me. I could still hear a third bird behind them, but that quieted pretty quickly. For the next hour, I paced around under the two adults (who watched my every move pretty calmly, but certainly closely), trying to get any possible vantage point where one inch of an adult leg was visible. Sadly, the angle plus the plethora of steel beams criss-crossing between me and the birds obscured most everything below their stomachs. Giving up, I decided to take a bunch of pictures of the beams hoping that when I got home and blew them up, the juvenile(s) might be in one. I made my way back down to Mary. As it turned out, she’d caught just the hint of wing ruffle from a third bird as I was up on the bridge, so between the two of us, she felt 99% confident we’d verified young at Calumet. I just got through looking over the pictures I took, btw. I’ve got about 100 pictures of the top halves of two very pretty adult peregrines glaring down at me from the bridge platform. 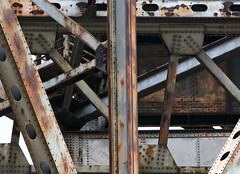 The remaining 70 pictures show various tangles of rusty steel beams. In two of those pictures, I can make out the shoulder of a juvenile peregrine snoozing on a diagonal platform. That’s a win. Now if I can just get the stupid lens cap off my scope. ~ by Steph on June 25, 2010.